Native American Indians made dream catchers by tying sinew strands in a web around a frame of willow which were hung above them at night to capture bad dreams, happy dreams were allowed through the centre. The bad dreams are destroyed as the sun came up the next morning. 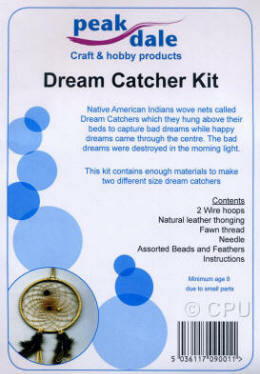 Includes two metal rings, leather thonging, feathers, assorted beads, thread and full instructions and makes TWO different sized dream catchers.